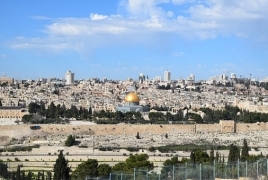 PanARMENIAN.Net - Australian Prime Minister Scott Morrison announced Saturday, December 15 that his government recognizes West Jerusalem as the capital of Israel, CNN reports. "The government has resolved that Australia's position is now as follows: Australia now recognizes West Jerusalem as being the seat of the Knesset [Israeli parliament] ... West Jerusalem is the capital of Israel," he said in a speech at the Sydney Institute. Morrison noted that for now, the embassy won't move from Tel Aviv, but that may change later. "We look forward to moving our embassy to West Jerusalem, when practical, in support of and after a final status determination," he said. "We've decided to start the work there now, to identify a suitable site for an Australian embassy in West Jerusalem." Morrison emphasized that a two-state solution is the only way to resolve the dispute. "A two-state solution remains the only viable way to resolve the Israeli-Palestinian dispute," he said. "The obstacles, we must admit, to achieving such a solution are becoming insurmountable." Australia has resolved to acknowledge "the aspirations of Palestinians people for a future state with its capital in East Jerusalem," he added. Australia's announcement regarding the capital of Israel differs from that of the United States a year ago because it refers specifically to West Jerusalem. When President Donald Trump made his announcement a year ago he made no such distinction between West and East, saying instead that the US recognized Jerusalem as Israel's capital. "Jerusalem is the seat of Israel's government," Trump said in a video message during the opening. "It is the home of the Israeli legislature and the Israeli supreme court and Israel's Prime Minister and President. Israel is a sovereign nation with the right to determine its own capital, yet for many years we failed to acknowledge the obvious, the plain reality that Israel's capital is Jerusalem."